A quinceanera party marks the transition from girl to woman for a Hispanic young lady. The party typically carries a theme, which the girl weaves through every aspect of the party from the invitations to the décor, attire, and party favors. A candy theme for a quinceanera that has a sweet tooth or is just sweet on turning 15 is a festive party theme. Purchase personalized candy bars or print candy wrappers with the party details such as the reason for the party, the date, the time and the place. Hand deliver the invitations to invited guests or mail them in small boxes. You can also find invitations in the shape of a peppermint candy or other favorite sweet. Use colorful tablecloths to represent the rainbow of colors of candy. 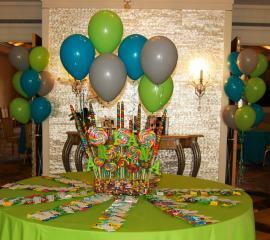 Each table can have a different color of linens and represent one of the party girl's favorite candies. For example, one table can have a Red Hots theme. Fill apothecary jars with the candies. Use a red overlay on a white table cover and use red linen napkins. Alternatively, table centerpieces can be created out of giant lollipops or candy bouquets. Create a candy or peppermint theme walkway into the entrance of your party venue. You can buy ready-made walkways from local and online party stores. You can also create your own with laminated red and white poster board. Place a candy cane arch over the entrance door. Hang a sign over the doorway that includes the party girl's name with Sweet Shop, so it says something like, "Daniela's Sweet Shop." Hang candy heart danglers from the ceiling. You can also hang big Hershey kiss danglers from the ceiling. The guest of honor can wear a gown that is a shade of pink that represents bubble gum. Each girl in her court can wear a bright color dress to represent the rainbow of colors of candy. Each guy that is escorting the girls in the court can wear a tie and vest that matches the dress color of the girl. If you are serving a sit-down meal or hosting a buffet meal for the event, feel free to choose foods of your liking. Talk with your caterer about building food into shapes that look like candy. For example, the caterer might be able to form mash potatoes to look like a lollipop-even using food coloring to die to potatoes. Offer plenty of candy and sweets options for dessert to stay in line with your theme. Create a life-size Candyland game. Each guest can take turns playing the board game, but in a real-life version. You can also set up Candyland board games on tables in one corner of the room. Instead of playing a life-size version of the board game, guests can play the board game in groups. You can also rent a cotton candy machine so that guests can make their own poofs of the sweet and fluffy treat. If you use large lollipops to create table centerpieces, guests can take the centerpieces home with them to enjoy after the party is over. Create a candy bar, so guests can munch on their favorite sweets during the party. Set up the table with apothecary jars filled with various types of candy. Provide silver candy scoops and cellophane candy bags with ribbon, so guests can scoop candy into the bags, tie them with the ribbon, and take home a bag full of candy as a party favor. 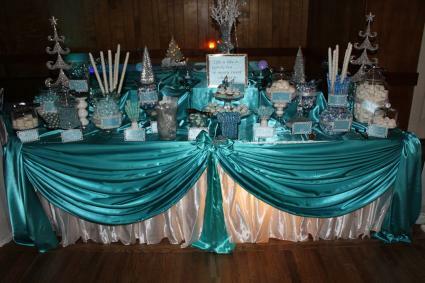 Whether the quinceanera turns 15 in the winter or winter is her favorite of the four seasons, winter wonderland is a popular theme. Shimmering snow, glittering snowflakes, and soft lighting can set the stage for a party with this theme. Whites, silvers, and light blues can help create the look and feel of a wintery wonderland. Invitations set the stage for the party theme for invited guests. Find a silver or blue shimmery invitation with a snowflake on it. A light dusting of silver glitter can be applied over the printed verse to give it a glittery look and a snowy feel. As an added touch, you can sprinkle snowflake confetti in the invitation envelopes. When guests open the envelope, the snow will fall. You can decorate the party from the outside to the inside and from top to bottom to infuse the winter wonderland theme. Start by lining the walkway into the ballroom, banquet hall or party venue with luminary bags that have snowflake cutouts. Place tea candles inside of the bags. Light the candles before guests arrive to give the illusion of glittery snow. Cover tables with white linen table covers. Place silver shimmery or light blue shimmery overlays on the table covers. Create table centerpieces out of Manzanita branches and sprinkle fake snow on the tables. Place a small round or square mirror under each centerpiece and place votive candles around the base of the pots or vases of tree branches. Hang strings of white lights around the room. You can choose to hang snowflake lights or icicle light string instead of plain white string lights. Place potted evergreen trees around the perimeter of the room. Hang white string lights on the trees. Decorate the trees with ornaments or snowflakes. The birthday girl should wear a glittery or shimmery white, floor-length gown. Crystals or diamond accents on the dress also help create the look of a snow princess. She can also wear ice blue shoes that match the color of her court's dresses. The girls in the court should also wear formal gowns in ice blue. Guys can wear formal tuxedos or dress pants and ties. Crisp white shorts topped off with ice blue ties and vests to match the girls' dresses is a nice look to complement the winter wonderland theme of the party. When you think winter, you think of ways to stay warm. This includes eating and drinking food and beverages that warm you from the inside out. In addition to the main meal, offer a hot chocolate bar for guests to enjoy the warm chocolate drink. Provide dark, milk, and white chocolate options. Also offer marshmallows and peppermint sticks for guests to add extra flavor to their drinks. If possible, host the event at an ice skating rink. Decorate the party room to create the winter wonderland. Have rental skates available for guests to skate around the rink. If you offer this option, include the information on the invitation so guests know to bring a change of clothing, mittens, jackets, hats, and scarves for their ice time. You can also set up a snowflake making station. Provide paper, scissors, glue and glitter. Guests can make snowflake decorations to take home with them. They can use the snowflake ornaments, banners, or other decorative items they make as Christmas or winter decorations in their own homes. Find snowflake ornaments that you can give to guests as party favors. The ornaments can be in the shape of a snowflake or be round bulb ornaments that have snowflakes imprinted or painted onto the ornament. Hang a personalized ribbon from the ornament with your name, the theme of the party and the date of the party. The ribbon can be an embellishment or it can be the way guests hang the ornaments on their own tree in the future. A girl from New York or one that loves the bright lights of the Big Apple can enjoy a New York, New York theme party. Create or order invitations that look like tickets to a famous Broadway show. Instead of the theater, however, your guests are invited to attend your big show-your party. Replace the "show details" you typically find on a theater ticket with the details for your party. Another invitation option is to use a photo of the quinceanera with a famous spot in New York City as the backdrop. Options include Central Park, the Statue of Liberty, the Metropolitan Museum or the Empire State Building. Use symbols that represent New York to decorate the party room. Purchase or create life-size buildings to create a New York City Skyline around the perimeter of the room. You can also create your own with cardboard, color poster board, paint and more. Use white twinkle lights to create the look of twinkling city street lights and the lights from buildings at night. Hang street signs that pay homage to the famous streets of the city. You can hang the signs on the walls of the party room. You can also opt to create street sign poles to display the street signs. Turn the aisles of your party room into different streets in the city. Display items that visitors can find on that street and turn your party room into the streets of New York. Create table centerpieces with items that represent the Empire State and the Big Apple. You can assign a theme to each table or use the same centerpiece for each table. For example, devote one table to the Broadway and theater scene of New York. Use a playbill, theater tickets and a stage light to decorate the center of the table. Surround it with lit tea light candles. Another table can carry a Statue of Liberty theme. Include trinkets that display the famous statue, including a replica of the statue. Black or white formal gowns are an option for the birthday girl. Dresses that have embellishments that add glitz and glamor to look are great options, like rhinestones and crystals. If the host wears black then the girls in the court can wear white gowns, or vice versa. The guys in the court can wear tuxedos with top hats to give it a New York, New York feel. The food in New York City is as different as the people and the cultures that make up the city. You can set up food stations to represent the variety of food options you can find in NYC. For example, set up a food station of Chinese food to represent Chinatown. Another food station can offer Italian cuisine to represent Little Italy. Yet another station can offer deli specialties, such as mini-corned beef sandwiches on rye bread. Hot pretzels with mustard and a hot dog stand offering a variety of toppings is also a must have. Set up a projector in one corner of your party room. Point it toward a blank wall or a movie screen. Play a series of black and white movies that were filmed in New York. Find typical "I Love NY" tourist mementos that you can give away as party favors. Bumper stickers, t-shirts, coffee mugs and pens are a few options. You can even wrap your giveaways up in apple-shaped bags or boxes so guests can carry their memento or mementos home in true New York City fashion. Consider adding a big Red Delicious apple to everyone's bag as well. Feel like a movie star for a night with a Hollywood theme party. The Hollywood theme is perfect for girls who are involved in high school drama clubs or enjoy the glitz and glamor of the movie scene. Use a Hollywood star cutout as a party invitation. The name on the star is the guest of honor's name. 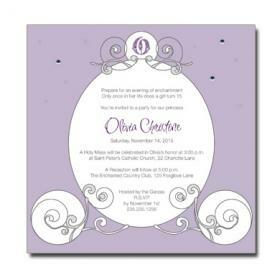 Include printed party details on the inside of the fold open invitation or on the bottom of a one-sided invitation. Sprinkle gold, silver or black star confetti in the envelopes to give guests the full effect when they open their invitations. 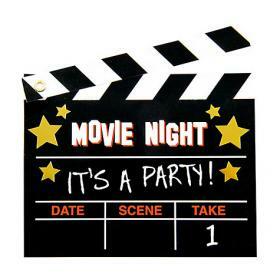 Another idea is to use a director's clapboard as the party invitation. Instead of including the movie and scene details, include your party details. Rent and roll out a red carpet for your guests to walk on as they arrive at your party. Have professional or amateur photographers flash photographs of guests as they arrive to create the look and feel of genuine red carpet events. Choose a corner of the room or a wall in the party room to devote to the famous Hollywood sign. You can cut the letters out of cardboard and paint them white or from white poster board. Use the pathways in between tables to create your own Hollywood walk of fame. Cut Hollywood stars out and add each of your party guests' names to the stars so that each guest has her own star on the walk of fame. Cover tables with black, gold and silver table covers and overlays. Sprinkle gold, black and silver star confetti on the tables. Use trophy replicas, such as a small Oscar award trophy, as part of the table centerpieces and décor. The birthday girl and her court should dress as if they are taking a walk down the red carpet. Formal gowns, tuxedos, jewels and accessories should be the focal point of attire. Long gowns in various colors are options, but can lean toward black or white. Girls can look in fashion magazines or on celebrity blogs that cover red carpet fashion, such as the Oscars or the Emmys. In Hollywood, presentation is everything. You can serve just about any food options you like. Rather than focusing on what you serve at a Hollywood party, focus instead on how you serve it. Consider platters that are shaped movie projectors, Hollywood stars in the walk of fame or other symbols that represent Hollywood. Popcorn theme boxes can serve appetizers or desserts, such as sugared donut balls. Set up a photo booth to take black and white pictures of guests. Include costumes and accessories guests can use to dress up for their photo shoot. Feather boas, top hats and canes are a couple of options for the guests to play dress up. The photos can also serve as mementos for the guests to take home to remember the fun time they had at your party. Place clapboard keychains at each place setting for guests to take home as party favors and mementos of the evening. The favors can be personalized to include the host's name, the name of the theme party and the date. Guests can reminisce about the party every time they use their keys. The birthday girl should feel like a princess on her very special day. A party fit for royalty is another option. Guests will feel like royalty when they receive a Cinderella theme invitation. Consider sending party invitations in the shape of Cinderella's carriage or her glass slipper. You can use invitations featuring tiaras, scepter, or castle. You can also print your party details on parchment paper, roll it into a shape of a scroll and tie it with pink, light blue, silver or chiffon ribbon that matches your party color scheme. Have someone dressed as a royal messenger hand deliver your invitations to party guests. Create a castle doorway for your guests to enter the party room. Place a royal announcer and a trumpeter at the entrance. Have each guest announced to the party room as they enter. The quinceanera celebrant can make her grand entrance by pulling up to the party in a horse drawn carriage, just like a princess. If the room or venue has a grand staircase, the guest of honor can also make her descent down the staircase to start the party. Place a tiara at each place setting for female guests and a crown at each place setting for male guests. Attach a place card to each one. Guests can remove the place cards after finding their seats to wear the tiaras and crowns for the rest of the event. Silver, light blue or shades of pink and purple are color schemes for princess parties. Cover tables with linens in the chosen colors. Find Cinderella carriage centerpieces you can decorate with pieces of ivy or flowers to match the party colors. Surround the carriages with lit tea lights. Fill the ceiling of the room with balloons to match the party color scheme. You can opt to place the balloons in ceiling netting to drop the balloons at the end of the event to make a grand finale. Line the perimeter of the room with potted trees. String white twinkle lights on the trees. This helps to create a cozy environment and create the illusion of a fairytale evening. If possible, rent a ballroom in a hotel or banquet hall that already has chandeliers hanging around the room. Hang plastic or fake chandeliers around the room to create a ballroom look and feel. Hang a paper castle in the back of the room, so that it looks as if the princess's castle is on the horizon. Place a Prince Charming life-size cutout or a Cinderella or other famous princess life-size cutout for guests to pose with for photo opportunities. A gown fit for a princess is the way to go for the host. You can model your gown after a famous real-life princess or one of the Disney princesses, such as Belle. Wear elbow-length gloves that complement your dress. You can even top the outfit off with glass slippers, Cinderella-style. The girls in the court should also dress like princesses, real or in Disney fashion. Guys should dress like princes in tuxedos with accessories that match the girls' dresses. The food itself can be the choice of the birthday girl. Finger foods served by tuxedoed servers passing through the room serving guests can give it a royal feel. Consider a castle or tiara-shaped quinceanera cake. You can also serve cupcakes with royal symbols on top, such as glass slippers, tiaras, crowns, castles or scepters. Arrange for a court jester to entertain your guests in true royal fashion. You can also arrange for a string quartet to set up on one corner of the room. Guests can enjoy the music of medieval times to make them feel as if they are partying in a castle. Glass slippers filled with candies make good party favors for guests. Wrap the glass slippers in white tulle and tie the tulle with a personalized ribbon. The ribbon can be a silver or ice blue color to match the theme. The tulle holds the candies in place and the ribbon adds personalization to the favor. Guests can also take home the tiara and crown place card holders they were wearing at the party. A Parisian theme can be a chic way to celebrate turning 15. Whether the young lady is heading on a trip to France or just wants to pay homage to a beautiful European city entrenched in culture and history, a Paris theme party can be the way to go. Two of the most recognizable symbols of France are the Arc de Triomphe and the Eiffel Tower. Use these symbols as backdrops for the invitation or consider supplying the party details on invitations shaped like one of these monuments. Create the city streets of Paris at night using a backdrop from online or local party stores. Add twinkling lights to potted trees that you place around the room. Build an Arc de Triomphe out of cardboard and paint to use as the archway for guests to enter the party room or as a backdrop for pictures or a large-scale version of the Eiffel Tower. Use Eiffel Tower place card holders to let guests know where they are seated for the meal portion of the event. Use replicas of the Eiffel Tower as table centerpieces. Think Parisian style when choosing a dress. Parisian women are known for their elegance and fashion sense. A dress with lace is very Parisian. She can also carry a parasol that she opens as she enters the party room. The court can wear lace, cap-sleeved dresses as well. They can be a different style than that of the guest of honor. The guys in the court can wear black pants, a crisp white shirt with the sleeves rolled up and a beret. Go French cuisine all the way. Offer guests fresh baguettes at the table. Offer a variety of French cheese, such as Brie, Camembert, as appetizers. Offer crackers, along with prosciutto and French dry salami, and choose traditional French food like Coq au Vin for the main course. Instead of a large cake, consider serving financiers, which are small light cakes that come in a variety of flavors. Play French music as background music while the guests are eating. You can have the DJ help you choose selections or have him play the soundtrack from Moulin Rouge. Art plays a vital role in the French lifestyle. Hire an artist or caricaturist to draw funny pictures of your guests dressed in berets and neck scarves. Personalize the votive candle holders as part of the table decorations with the date and the name of the host. Guests can take these home with them as party favors to remember the night. Place chocolate Eiffel Tower mementos for guests at their place settings. They can eat the chocolate tower for dessert or take it home as a party favor to savor after the party is over. Bring the celebration of Mardi Gras to the party. 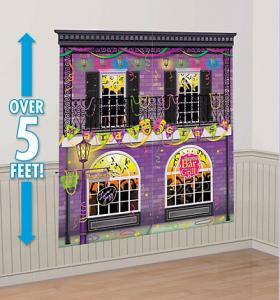 Turn the party room into the streets of New Orleans during the Mardi Gras celebration. Attach your party details on a purple, gold or green cardstock to a Mardi Gras mask. Mail the invitations in padded envelopes or hand deliver them to your party guests. Encourage your guests to wear their masks as they arrive to the party. You can also use one-panel or foldover party invitations with a mask theme. Create a small scale parade float decorated in the Mardi Gras colors of purple, gold, and green. Decorate the float with items that symbolize Mardi Gras, including masks, beads and Mardi Gras jesters. As guests arrive at the party, have people manning the parade float throw beads for your guests to catch, just as if they were on Bourbon Street watching the Mardi Gras parade go by. Turn feather boas, balloons, and Mardi Gras masks into table centerpieces. Use a Mardi Gras mask with a handle on it as a balloon bouquet anchor for a bunch of purple, gold and green balloons. Turn a feather boa in Mardi Gras colors as table runner to decorate the table. Sprinkle fake gold coins on the table. Drape Mardi Gras beads at each place setting. Turn the walls of the party room into Bourbon Street. You can buy a Bourbon Street scene at most major online and local party stores. The guest of honor can adorn a ball gown in purple, gold or green. She should carry a feather mask on a stick that has colors that coordinate with her gown. The court girls can wear alternating gowns. So if the birthday girl wears a purple gown, then the girls in the court can wear gold and green gowns. Matching feather boas can complete the outfit. The guys can wear black slacks with a white short. Ties can coordinate with the girls' dress colors. Serve fête that is famous to New Orleans. Options include Jambalaya, red beans and rice, shrimp, and crawfish. Offer guests non-alcoholic Hurricane drinks. Serve mini king cakes, which is a traditional Mardi Gras cake. Hire a strolling jazz band. Have the roam around the room playing jazz music during the party. You can also opt to set them up on the parade float as a type of stage, so they can entertain guests before and after the meal is served. Toss out Mardi Gras beads from the parade float. Beads can be the traditional green, gold and purple colors of Mardi Gras. You can also choose fancier beads, such as faux pearls, jester-shaped beads or large ball necklaces that come in Mardi Gras colors. Feather boas are also fun party favors to hand out to guests. Male guests can enjoy jester hats that they can wear during the party and to celebrate Mardi Gras for years to come. A masquerade party theme requires guests to wear masks. To narrow down the options a bit, the guest of honor can choose to simply impose the mask rule or can be more specific on the theme, focusing on Phantom of the Opera, for example. Purchase a wearable mask for each of the party guests. Attach a cardstock with the invitation details to the mask with a ribbon that matches the color scheme of the mask and the party. Instruct guests to wear the mask to the masquerade ball. This helps to eliminate the guests from having to find their own party masks while tying in the theme of the party with the invitations. These invitations can be mailed in a box or hand delivered. Masquerade balls tend to be opulent and elegant affairs. It is ideal to rent a hotel ballroom or the ballroom in a banquet hall for this theme. Look for rental rooms with chandeliers, lush carpeting, wall and window drapes and decorative ceilings. Use black and white table linens-white table covers that reach the floor covered with chiffon or glittery black and sheer overlays. Cover chairs with linen covers. Tie chiffon ribbon bows on the backs of the chairs. The ribbon color and material can match the black overlays. Slide a mask on a stick into each bow to decorate the chairs. The masks can also be used by guests who forget to bring their masks with them to the party or as party favors to take home when the night is over. Rent a spotlight to light up the entrance of the ballroom to shine on guests as they arrive. You can also rent a spotlight that shines around the ballroom during the event. Balls tend to work with the Venice of the 19th century theme. Backdrops can include a stage to signify the Phantom of the Opera ballroom scene from the musical, or can be the city streets and canals of Venice, or Venetian architecture. Use candelabras as table centerpieces. Light the candles before guests arrive. You can leave ornate and tall candelabras as is or wind ivory or other decorative flowers around the candelabras. Keep decorations as far away from the flames of the candles as possible. Scatter mask confetti on the tables. A formal gown is in order for a masquerade ball. The quinceanera celebrant can wear a formal black ball gown. Black and white gowns are also a possibility. A tiara is definitely in order for this type of party, along with jewelry to accentuate the look. High heel formal shoes complete the outfit. The court should also dress formerly. Guys should wear tuxedos with vests and ties that match the color of the gowns the girls in the court are wearing. The girls in the court should wear matching ball gowns. Bright jewel tones are appropriate for a masquerade party. The girls' gowns should complement the host's gown but should not be the same gown that she is wearing. The girls should also wear necklaces, earrings and bracelets that match, along with coordinating formal high heel shoes. Finger foods are good food options for a masquerade party. Consider offering a chocolate fountain, where guests can dip fruits and other sweet treats, such as angel food cake, marshmallows and brownies into the chocolate. Fruit platters are other good options for cold finger foods. Mini-sandwiches, beef Wellington appetizers and chicken skewers are other options for passed appetizers. You can also set up buffet tables with these various food choices so guests can help themselves. Set up a mask-making station. Provide guest with undecorated masks and all of the embellishments they need to make their own masks. Jewel embellishments, feathers, glitter, glue and sequins are some of the decorations you can provide. Guests can take home the masks they make as party favors. You can also place mask-shaped lollipops at each guests' place setting. Guests can enjoy the favors at the party or take them home for a sweet treat later. For a girl that loves sea life or the movie The Little Mermaid, an under the sea party theme can be ideal. Find invitations that present sea life. This can be a shaped invitation or one that has a background or border that depicts sea life. Examples include dolphins, fish, ocean waves, the beach or the ocean. Hang fish nets over the entrance door to the party room. Cover the tables with linens representing the sea. Adorn the center of the table with big fish bowls. Decorate the inside of the fish bowls with colorful stones, sea plants and treasure chests. You can place the fish bowls on top of small round, oval or square mirrors and surround them with lit tea lights. This can add the shimmering effect of the water to the tables. Drape the walls of the room with shimmery fabric in silver, light blue, dark blue or a combination of these colors. This can create the look of wavy water so that guests feel as if they are under the sea. Hang fish, octopus, sharks, and sea plants on the wall drapes to create the look and feel of what it is like to be under the sea. You can also find backdrops that depict underwater scenes. Place a big treasure chest in one corner of the room. Fill it with fake gold coins, jewels, and other treasures you might find in a sunken treasure. Rent or buy a mermaid and merman life-size standup with the face cut out of each. Guests can pose for pictures. Rent a water fountain from a local party rental company. Flowing water can create the sounds of sea life. Point colored spotlights at the fountain to light it up in different shades of blue. The guest of honor can wear a mermaid-style dress. Choose a color that represents the water, such as a shimmery silver or blue material. Glitter or sequined gowns with mermaid tailoring can also coordinate with the look and feel of the sea. Matching formal shoes and jewelry can complement the look. The court should also wear similar style dresses in a color that complements the quinceanera celebrant's dress. The gentlemen in the court can wear shimmery blue ties and vests to match that of the dresses of the girls in the court. Seafood is the way to go for an under the sea party. Fish, shrimp, crab legs and scallops are a few of the options. Check with guests before the party to see if anyone has food allergies. You can offer alternative meals for those with shellfish allergies. Hire a reggae band or play reggae music. It adds a Caribbean style and feel to the party. Softer reggae options are available to play during the meal. More upbeat options are available to get your guests out on the dance floor. Fill a small treasure chest with gold chocolate coins. Guests can eat the chocolate candies at the party as dessert. They can also take the goodies home with them to eat later. Choosing a theme for a quinceanera can make planning the party fun and easy. You can find ways to weave the theme through all of the aspects of the party, from how to invite guests to what the birthday girl wears.